Collier, William, Miller, Diplomat. Born Lodi, NY, Nov. 1867. Son of Rev. Isaac H. and Frances Miller. Married Frances Beardsley Ross of Auburn, Sept 13, 1893, great grand-daughter of the late Nelson Beardsley of Auburn and Elmore P. Ross, Auburn, both prominent in financial and political life of central New York. 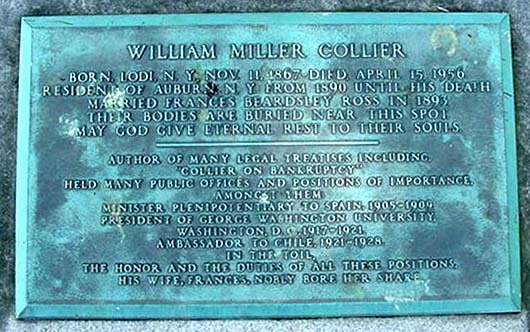 Mrs. Collier is ninth in descent from "Goodman" John Beardsley who settled in Connecticut in 1632. Home: 2 Hamilton Ave., Auburn, NY. Held many public offices and positions of importance. President of George Washington University, Washington, DC 1917-1921.
his wife, Frances, nobly bore her share. The Collier lot is located in the Consecration Dell section.